Current Market Analysis: It is really easy to like national bank notes from Minnesota. Lots of little fancifully named communities had their own national bank. Many notes are hand-signed, which is always a bonus. In the late 1800s and early 1900s there were lots of European immigrants in Minnesota. They were fond of hoarding cash. Many otherwise very rare bank notes have been saved thanks to cash hoards that were discovered after decades in hiding. The good news is that there is no one area of Minnesota that is more desirable than another. The bad news is that prices for Minnesota notes are probably down 30% off their highs. However, rare and high grade notes still don’t have very much trouble finding a qualified home quickly. 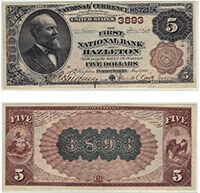 We buy all antique paper money issued by The First National Bank of Fergus Falls, MN. We can tell you how much your $5 bill is worth. We aren’t just dealers. We are also collectors, experts, and appraisers. We have contributed to numerous price guides and are considered specialists in the field of national currency. Contact us via phone or email to get your free appraisal today.